2004 Chevy Colorado Base, LS, Sport, Z71, Z85, GMC Canyon SL, SLE. 2005 Chevy Colorado Base, Sport, Z71, Z85, GMC Canyon Z71, Z85. 2006 Chevy Colorado Base, LS, LT, WT, GMC Canyon SL SLE, SLT, WT. 2007 Chevy Colorado Base, LS, LT, WT, GMC Canyon Base, SL, SLE, SLT. Each Strip LED bulb contains Super Bright36 White Leds and72 Red Leds, Total 108LEDs. It hasMulti-Functions, Red lights for Right & Left Turn signal Lights, Brake & Parking, White Light for Reverse Lights. 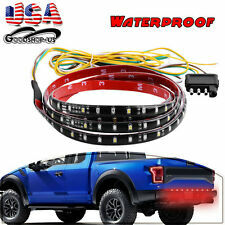 Multi-Function 60" LED Strip Tailgate Light Bar Turn Signal Reverse Brake. Each Strip LED bulb contains Super Bright 36 White Leds and 72 Red Leds, Total 108LEDs. 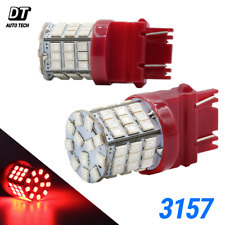 It has multi-Functions, Red lights for Right & Left Turn signal Lights, Brake & Parking, White Light for Reverse Lights.HAVE ONE STRIP AND GIVE YOU MULTI FUNCTIONS ! 2008-2012 GMC Canyon. 2008-2012 Chevrolet Colorado. Manufacture: GM. Part Number: 20985455 & 20985454. Fits 04-12 GMC Canyon Pickup All Models. Fits 04-12 Chevy Colorado Pickup All Models. Red Clear Lens. GMC Canyon. Chevy Colorado. Compatible on Left Driver Side Only. Driver Side Only. Our main distribution center is over200,000 sq ft in sunny Southern California. No local pick up. 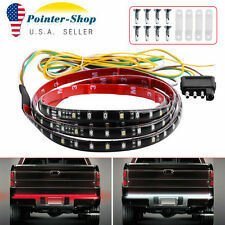 Full LED Function Tail Lights , NO Bulbs Needed !! 2004-2012 Chevy Colorado & GMC Canyon (For US SPEC only). 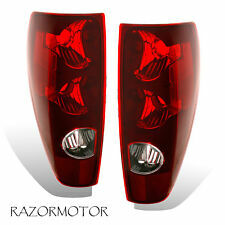 - x1 Pair of Rear Tail Lights Assemblies (2 Pieces, Left and Right). 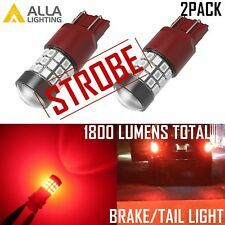 -Unique Black Housing With Built In LED For Brake and Clear Lens Design - This will gives a brighter brake light output with REAL L.E.D.s - Latest trend & technology! GMC Canyon. Chevy Colorado. Tail Light. Black Housing/ Smoke Lens. Cyber Black. Our main distribution center is over200,000 sq ft in sunny Southern California. No local pick up. GMC Canyon. Chevy Colorado. 3rd Brake Light. Bullet-Cap LED. Our Lights have Tech-Leading DIP LED's which illuminate up to 10x faster than incandescent bulbs alerting trailing drivers sooner for added safety while bringing a new modern look to your vehicle with brighter, more efficient lighting. 2004-2012 GMC Canyon. 2004-2012 Chevrolet Colorado. Part Number: 20807035. GMC Canyon. Chevy Colorado. Onyx Black. Black Housing/ Clear Lens. Our main distribution center is over200,000 sq ft in sunny Southern California. No local pick up. GMC Canyon. Chevy Colorado. [ Tail Light ]. Onyx Black. Black Housing/ Clear Lens[ Headlight ]. Our main distribution center is over200,000 sq ft in sunny Southern California. No local pick up. GMC Canyon. Chevy Colorado. Tail Light. Onyx Black. Black Housing/ Clear Lens. Our main distribution center is over200,000 sq ft in sunny Southern California. No local pick up. GMC Canyon. Chevy Colorado. [ 3rd Brake Light ]. Bullet-Cap LED(3rd Brake Light). Tail Light. Our Lights have Tech-Leading DIP LED's which illuminate up to 10x faster than Incandescent Bulbs alerting Trailing Drivers sooner for Added Safety while bringing a New Modern Look to your Vehicle with Brighter, more Efficient Lighting. "Anzo Tail Light --ANZO – LED TAILLIGHTS. LED taillights by Anzo can give you that modernized custom flair without having to invest in a new vehicle altogether. Series : Anzo LED. Quantity sold : Set of 2. 2008-2012 GMC Canyon. 2008-2012 Chevrolet Colorado. Part Number: 13631640. FOR 2004-2012 Chevy Colorado / GMC Canyon. & 2004-2012 GMC CANYON. 2004-2012 CHEVY COLORADO. SAE / DOT Approved! CRYSTAL SMOKE REAR LED 3RD BRAKE LIGHT. OF CRYSTAL SMOKED LED 3RD BRAKE LIGHT. Smoke color shown in the photo might look darker or lighter than the actual parts due to photo lighting. 2008-2012 GMC Canyon. 2008-2012 Chevrolet Colorado. Part Number: 25861049.